This old style Porter Cable Multi-Tool fitting flush cut scraper is great for cutting away adhesives, caulking, silicone or any other material build-up away from a desired work surface. The sharp knife edge is quite capable of cutting-up carpet, leather, linoleum of cardboard. 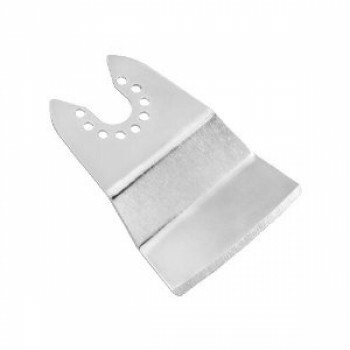 Comparable to the Porter Cable PC3020 scraper, the flush-cut (step-down) profile design allows the operator to lay this scraper blade flat on the work surface for consistent controlled scraping. The PCM3020X Flush Cut Scraper is designed to be compatible with the Porter Cable PC3020 scraper blade and is excellent for removing caulking or adhesives from a base surface. The flush cut profile allows this blade to follow and remove material away from surfaces without damaging.